Before we begin, you need to know that I received compensation for the time it took me to write this review. You should also know that if I thought the website, courses, and product were terrible, I would have returned their money and chosen not to write the review at all. The folks at JumpCourse.com asked for an honest review, and the great thing is, I am super impressed with what they have to offer. Because of this, I'm going to continue promoting their courses as well as using them in our home. Why? Because JumpCourse.com is doing it right. Our firstborn, as some of you might remember, is just about done with his Bachelor's Degree, having done the whole thing using a combination of CLEP courses, DSST courses, community college classes, and online courses from the college where he'll earn his degree. The whole shebang is costing us less than $10,000, which means he'll have earned his undergrad degree with no debt. None. Oh, the money I could have saved my folks . . . Anyway, what impresses me so much about JumpCourse.com is the way it's been put together. An easy-to-navigate website, really helpful tutorial videos, and features that make it intuitive and easy to use. So for the sake of review, our son Jack (16) decided to take the Psychology 101 course. He's convinced that taking some CLEP credits into college with him (he wants to go to a brick and mortar school) is a brilliant idea, so he's starting to prepare to take the tests. Taking CLEP's like this is what we call dual credit, and it makes absolute sense in a homeschooled high schooler's curriculum plan. 1. The student watches the video for the section. It can be paused, rewound, and watched with closed captioning. 2. The student studies the lecture notes (displayed like and eBook), and in Jack's case, makes their own notes to help them remember and absorb the information. 3. The student works on the learning activities and exercises, which get progressively more difficult. They're visually pleasing and make you think. 4. If the student can't answer a question correctly, it will take him back to an easier level to make sure he attains mastery. Hints are provided, too. 5. As the student masters sections, additional sections and units become "unlocked", and the student can work on any unlocked section they want, in any order. 6. The student can complete as few or as many activities as he needs to show mastery in a section. This is a great feature. He can improve mastery in any section he desires. 7. JumpCourse.com uses an adaptive learning technique, meaning the system knows what you need help with based on your prior work. Review is continual to reinforce learning. 8. Students set up a profile and an optional study group from within the website. Study groups are a really cool feature! Some of my kids have done well studying in a group, and JumpCourse.com gives them the option to do that with them, too. 9. JumpCourse.com offers really accessible help, a study board, and the ability to discuss your course with other students and the instructor, too. Right now, JumpCourse.com only has four classes: Psychology, Sociology, Financial Accounting, and Organizational Behavior. Coming this month, more courses are being added, and by the end of 2014, JumpCourse.com will have 23 courses. A student could earn an AA solely from JumpCourse.com! Study anywhere - even in my room! Jack plans to take the Psychology CLEP this summer, in between his junior and senior years. He'll take an AP English class next year, then another CLEP the summer after he graduates, which means he'll have three college courses in the bag. 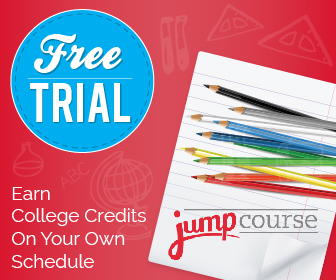 $99 JumpCourse.com fee plus $80 CLEP test fee = $179 college course, fully accredited by the College Board. Get 50% off one JumpCourse.com course by using code HOME50 by June 30, 2014. Ready to try? Check out the JumpCourse.com site. You can also connect with JumpCourse.com on Facebook, Twitter, Pinterest, YouTube, and Google+.